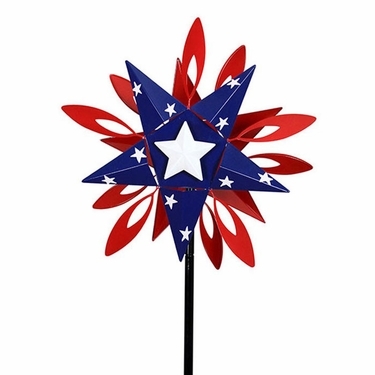 This brand new 74" Giant Patriotic Star Garden Wind Spinner will bring fun, color and motion into your garden. Constructed with stainless-steel ball bearings, this all metal design wind spinner will dance gracefully right before your eyes. Painted with vibrant metallic paints in shades of red, white and blue with a lovely big white star in the center, it will shine in the sun and dazzle as it spins. Firm 4-prong pitch stake bottom for extra stability so it will continue standing tall and proud in your garden. Size: 21" x 11" x 74"H, Metal.